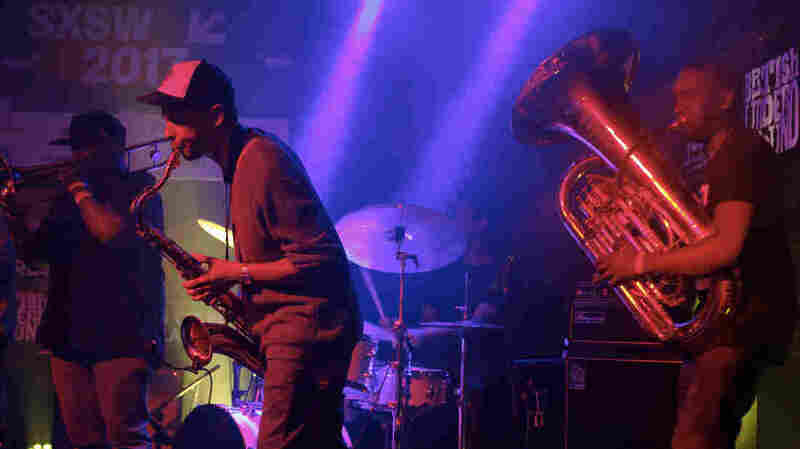 Get To Know London's Thriving Jazz Scene (By Way Of Austin, Texas) Players like Moses Boyd, Shabaka Hutchings and Sarathy Korwar drive London's jazz scene forward with sounds from around the world. In March, SXSW hosted all three for an up-to-the minute dispatch. Nathaniel Cross on trombone, Binker Golding on tenor saxophone, Moses Boyd on drums and Theon Cross on tuba perform at SXSW in March 2017. This all went down in mid-March, at a club just off bustling East Sixth Street in Austin, Texas. Jazz Night In America was there — because for that evening, strange as it sounds, there were no better coordinates in the world for an up-to-the-minute dispatch from the vibrant new jazz scene of London. Boyd is an anchor of that scene, and in some ways a shining embodiment of it: Born and raised in Southeast London, to parents of Jamaican and Dominican stock, he grew up around a cacophony of West Indian and African music, as well as jazz, garage, dubstep and grime. He brings those elements together in his music, with the no-nonsense flair of someone accustomed to a high standard for cosmopolitan exchange. Shabaka Hutchings, the lanky, soft-spoken tenor saxophonist and clarinetist who leads Shabaka and the Ancestors, subscribes to a similar ideal. Born in London, he moved to Barbados at age 6 and stayed there for the next decade. As a returning Londoner, he gigged with a wide range of groups, forming one of them — Sons of Kemet, inspired by folkloric African and Caribbean sources — with colleagues including tuba player Theon Cross. Hutchings received global acclaim for his most recent album, Wisdom Of Elders, featuring musicians from South Africa. Sarathy Korwar, a percussionist and electronic producer born in the United States but raised in India and now working in London, also released a knockout album last year, Day To Day. Working with his own field recordings of the Sidi Troupe of Ratanpur, which consists of five drummers who also vocalize, Korwar sought to illuminate patterns of human migration and drift, and the small-scale but profound ways in which cultures can meld. Three More SXSW-Bound Bands Denied Entry Into The U.S. The injustice of the exclusion became a subtext in the British jazz showcase at SXSW, which was presented by the London curation engine and record label Jazz Re:freshed. The show ended with a solidarity jam, featuring Boyd, Hutchings and Korwar, along with their bandmates.